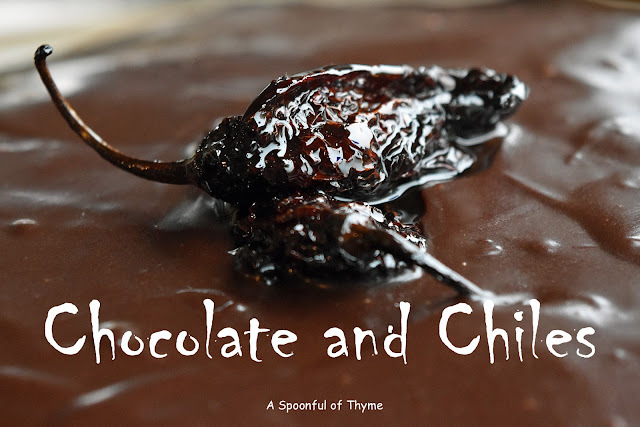 While this sounds like a crazy combination, chocolate and chiles actually work well together. In fact, this duo has been around since about the 16th century and may have originated in Mexico when convent nuns were trying to prepare a meal for their guest, the archbishop. They started mixing a little of this and that and created a mix or "mole" which is well known in Mexican cuisine. 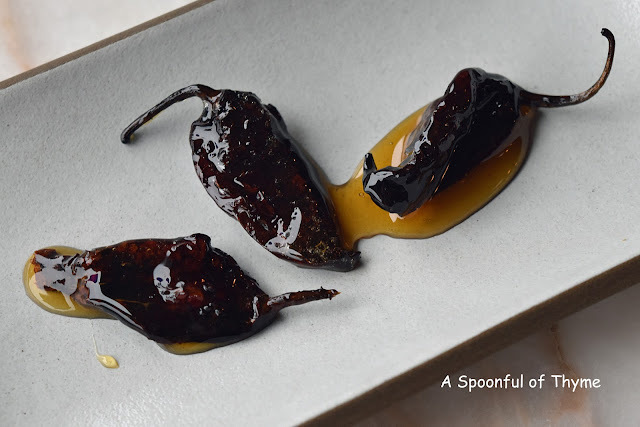 The chocolate and chili duo is the theme for this month's Improv Cooking Challenge. It is fun to be challenged to find or create a recipe following a designated theme. I was originally going to make a chicken mole. 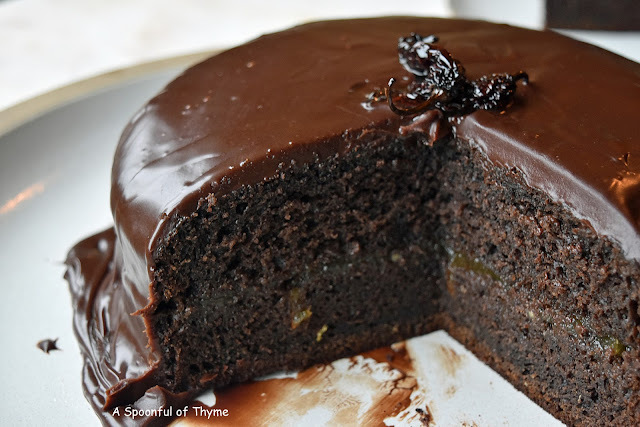 I have never made a mole and it sounded great but I got lost along the way.... As I was searching for the chiles that I needed to make mole, I came across a recipe for Ghost Chile Honey Cake that was really intriguing. I was familiar with the ghost chili as I had eaten a burger with ghost pepper cheese. It was super delicious and quite memorable! The Bhut Jolokia, the ghost chili, is from India and holds the Guinness Book of World Records as the hottest chili pepper in the world! While the pepper has a very nice smoky flavor, it is the heat that really gets ya! A little of this pepper certainly does go a long way. India's Bhut Jolokia is 10 times hotter than a habañero! You may be asking how in the world this can work in a cake. It works because the chili peppers are infused in honey. The fire is mellowed and the flavor is what shines through. The cake isn't as scary as it sounds. I think I detected more of the chili heat when the frosting was warm. The slice I ate had a very nice flavor but there wasn't any heat! Heat one cup of honey in a small pan over a low heat. Make a small slit in three ghost chili pods. Submerge them in the honey. Steep the chiles for 30 minutes. Cool to room temperature. Pour the honey and chiles into a container and set aside. Preheat the oven to 350° F. Prepare a 9-inch cake pan by spraying or greasing. Cut a piece of parchment to cover the bottom of the pan. Whisk together flour, baking soda, salt and cocoa powder in a small bowl and set aside. In the bowl of your mixer, mix together the sugar, infused honey, eggs and vanilla, until blended. Add the vegetable oil, then half of the flour mixture. Mix until blended. Add all of the buttermilk and mix until just blended. Add the remaining flour mixture and mix until incorporated. Pour the batter into the prepared cake pan. Bake the cake about 55 minutes or until your cake tester comes out clean. The cake will have a slight "dome". Let the cake cool in the pan for about 10 minutes. Then, invert onto a cooling rack to finish cooling. Remove the parchment. Put the chocolate in the top of the double boiler or in the bowl. Stir until almost melted. Set the bowl aside. Empty the bottom/saucepan. Pour in the remaining half cup of infused honey and the cream. Bring to a boil, then pout over the melting chocolate and stir until smooth. Let it cool. When the cake has cooled, carefully cut it in half horizontally. Place the bottom of the cake onto a cake dish. Spread the marmalade over the cake bottom, being careful not to spread it all the way to the edge. Place the other half of the cake on top of the filling and gently press down. Frost the cake using an offset spatula. After putting the frosting on the cake, it may be smoothed out using a clean knife that has been dipped into hot water. The warm knife will smooth out the frosting. NOTE: If you desire a spicier cake, 1/4 teaspoon of ghost chile flakes may be added to the batter or the frosting. I would make this cake again but I would probably add the ghost chili flakes just because...I'm curious and want to know what it would be like. If you are interested in taking part in the Improv Cooking Challenge, hosted by Nichole at Cookaholic Wife, please visit her post for all of the information. It is great fun! 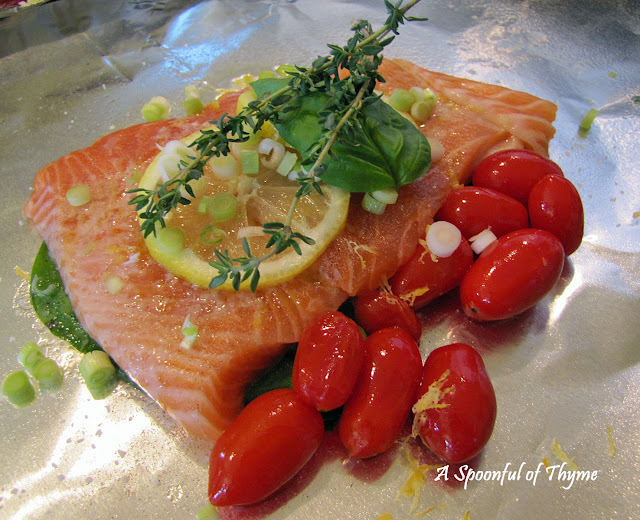 I am also sharing at Full Plate Thursday hosted by Miz Helen's Country Cottage. This looks incredible! I don't even know where to find ghost chiles but I would love to try this cake. 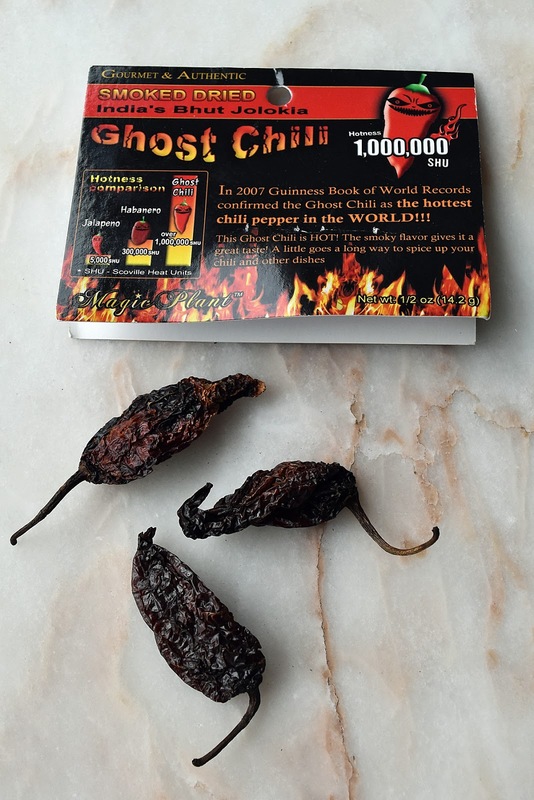 I have never heard of ghost chiles...hotter than a habanero is saying something though! I would love to see how this tasted. Beautiful cake, Kate! I am such a chicken when it comes to ghost chile peppers. But this is intriguing. Ghost peppers scare me! But a couple of my fellas love them & like food made with them. I might need to use your recipe. 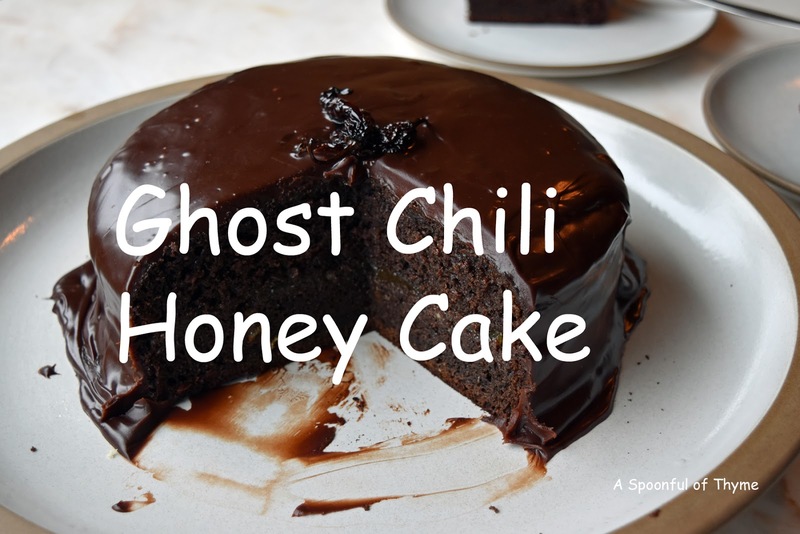 This cake looks delicious, I'd be a bit nervous with the Ghost Chilis but what a unique idea!